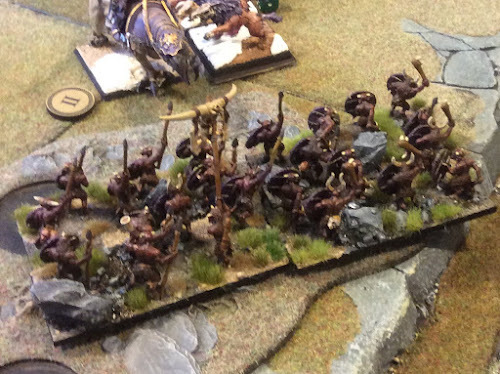 One of my favourite units in my Herd are my Spiritwalker Horde. They have okay (4+ Me) and 35 Attacks. However their greatest attributes in my mind are their high Nerve (23) and the fact they can't be Wavered. I use them as a multifunction unit that can be both offensive and defensive. Sometimes they will take the fight to the enemy while others they will just block off an area of the battlefield. Always looking to maximise the functionality I had a look at the new Dragonshard Shield as a potential force multiplier for them. Now on the face of it the ability to increase De by +2 even once by game is very attractive. However there is a downside which I have placed in italics. To get the benefit of this increased defence your enemy has to charge you knowing you have it and, as well as the cost of 20 points and forgoing any other item, the only movement you can do is Pivot. To say that the benefit of this item is "situational" is probably understating it! To activate it you are probably giving up the opportunity to inflict 35 attacks on an enemy unit. Even with no modifiers over their TC1, this is approx 15 wounds on De2-3, 12 on De4 and 9 and 6 on De 5 and 6 respectively. That is quite an opportunity cost! There are two situations where I can see it having great utility. First, when facing multiple enemies. The Horde is 200mm wide so can accommodate a lot of charging units. When this is the case then it certainly has its worth. The second is when it is sitting on an objective or holding one. Again it has its worth as it may reduce the unit to immovable. But as I say it is situational. The question is where do you get those points. In my Herd I certainly wouldn't give up Healing Brew and Blood of The Old King Kittens for it. Perhaps Helm of the Ram but with that I know I'll always get use. Same with the Lute. What we have here is a dilemma where we are balancing certain use versus potential game winning. I have looked at ways of approximating but again these are largely situational. One way is to park the Horde in Difficult Terrain so any charge accepted is Hindered. That would reduce damage somewhat but not as much as the Shard. Of the other magic items, Brew of Courage reduces the effect of damage by effectively increasing Nerve and is constant. It is an interest situation as I can see over a tournament how the Shard could be decisive but the majority of the time it is a 20 point opportunity cost. I am curious as to your interpretation of the rules for using the Dragonshard Shield after a combat. Example. Charging and breaking an enemy unit and then change facing/halt but activating the Shield. Do you get it? If so it helps to solve some of the opportunity cost of the item. Just realised that that's an error. There's no such thing as a Pivot! order. I assume they mean Change Facing! Yep. Don't know where I got Pivot from - meant Change Facing! You got it from the CoK book. It's an error in there. Notably, After a unit breaks another unit it is not given and order just has options that act "as per a change facing order" it can be read either that you are changing facing as per and exactly like giving and order, or it can be ready that because you are not explicitly giving a change facing order, it does not give an opportunity to trigger the shield. I'm pretty sure it is the later.